Ken Kesey’s One Flew Over the Cuckoo’s Nest is one of my favorite novels. This is his lesser known, though some would argue more developed second novel. It follows the exploits of the Stamper clan, a family of hard-nosed loggers in the fictional town of Wakonda, Oregon. Henry, the batty old patriarch, and his son Hank run the family business. But when the union loggers at the local mills go on strike, the Stamper family decides to pick up the slack and provide the mills with the lumber they need, much to the dismay of pretty much everyone in town. To help manage the work, they reluctantly call for Hank’s half brother, Leland, an intellectual who attends college on the east coast and, as we soon discover, has a thing for Hank’s wife, Viv. What transpires is a battle of man against nature, man against society, and of brother against brother. 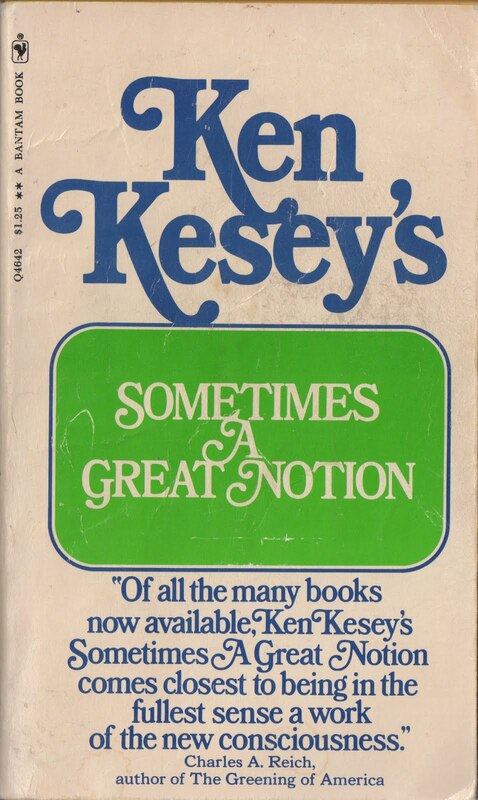 Kesey jumps unannounced from first-person narrator to first-person narrator in a way that is often jarring and sometimes confusing, but gives us insight into each character’s motivation. They are all fully-realized, often conflicted, but all likable in their own ways, with principles that sometimes hold them back and other times propel them forward toward madness. Sometimes a Great Notion is a fantastic novel, as deep and winding as the river that pulls at the foundation of the ramshackle Stamper house. It meanders and strays, is sometimes humorous, sometimes philosophical, sometimes dark. The writing is often breathtaking and the plot wraps around big themes of individuality, society and the struggles that occur when men of stone-etched beliefs encounter forces that are bigger, stronger and more unbending.